This article talks about the gender bias. People may say equal opportunities are given to everyone. I agree. I ask, "Are we given equal recognition? Equal remuneration?". No, it is not. Let us think a while, how Men are more benefited than other genders. Giving a thought could bring many changes in your perception and you may come up in changes within yourself. In this millennium, it is proved that gender is not a criterion to be successful or a limitation to take part in any activity. There are times, when some fields are allotted only to one gender like education to men and home care is to women and begging was the only option given to transgender. After years of efforts, the scenario was not the same. Now all genders were given education, job and opportunity to explore their dreams. There are many exceptions depending upon their own family and the society they live in. Now gender bias has taken a different face. Initially it was about opportunity to everyone, now it is about recognition to everyone. Do we need to wait for years to get equal recognition and remuneration for all their efforts, irrespective of their genders? Yes, now there is no limitation to take part in any work, but facilitation and recognition is favorable only to men and limited to other genders. It is true that Woman were given opportunities to hold higher positions in Indian constitution. We see woman as Chief minister, President and Prime minister in India. Even after proving their leadership qualities, why women's reservation bill was lapsed in our parliament? Now, a question may arise, that no one was restricted to nominate oneself in election or to win or to become a part of constitution, so why not women and transgenders nominate themselves?! If that could be your answer, well, why caste base reservation still exists in India, irrespective of their financial status? The reservation creates a space to increase their presence in such field. The same we are looking in politics. Let the Women's reservation bill be passed, also some seats to transgenders be allotted, so that, politics have mixed proportion of all the genders. Comparing to any other field. Job opportunities to male and female is equal in corporate. But coming to facilitation, recognition and remuneration, the men and other genders are not equally treated. We all know, Dr. Muthulakshmi, the first woman Doctor in India was not given medical seat, because, the college did not have separate women's toilet. It is a responsibility of the institution to facilitate their students. In similar way, corporate with social responsibility, need to facilitate for their women employees considering their physical needs. But many corporate thinks only of labor to revenue ratio and fires women once they get pregnant. There are companies gives lesser ratings to their work, if they are married, or got pregnant, thinking that they will not continue their work. Women do not get promotions in corporate easily. They were questioned about their family planning during their new project enquirers and decisions were made accordingly. Women with same designation as men, gets lesser remuneration, lesser rating and delayed promotions. Women, like men knows their responsibilities to their work, but corporate don't understand it. Corp orates as per the law facilitates maternity leave but truly they build their case to fire that woman instead of giving vacation. Entertainment industry like cinema, television and other music industries give equal opportunity to men and women and lesser opportunities to transgenders. But the remuneration is considerably lesser than male artists. When a hero doing stunts with droop could be paid more, why not a heroin dance in miniskirts and sleeve less in zero degree Celsius be paid equal to him? Acting is a profession, all genders do the same in front of a camera as per the script, why not they been equally remunerated? Why the heroes are recognized as super star, ultimate star, power star and no actress was recognized as anything? Entertainment is something, people choose as a career not only for money, but for identity, let everyone be recognized to their skills, irrespective of their gender. Society, here I don't only about the people in our surroundings. So, when you are reading this, please don't think that, I talk about somebody else. Just feel your heart and see yourself when you have undergone these scenarios or when you have been a part of this society, being a silent spectator seeing gender bias, when it is happening before you. When transgenders come near you and ask for the money in bus stops or train or in your shopping streets, you might have felt disgusted, but have you ever thought, why can't you see them working in a corporate or a Government office or a politician or a hero/heroin? They are forbidden. They wanted to live their life, but they were not given a life to live like you. No matter who it is, either it is women, transgender, men - choice of your hormonal needs is purely your choice. people who judge is not going to live your life. 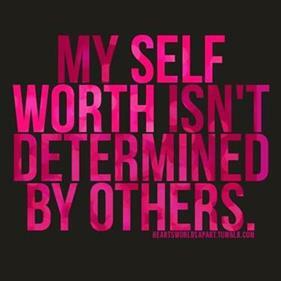 Love yourself, live your life to the fullest. Let the dark night fade, sun shines. This gender bias was there in giving opportunities in olden days, now it turned out to be in recognition. 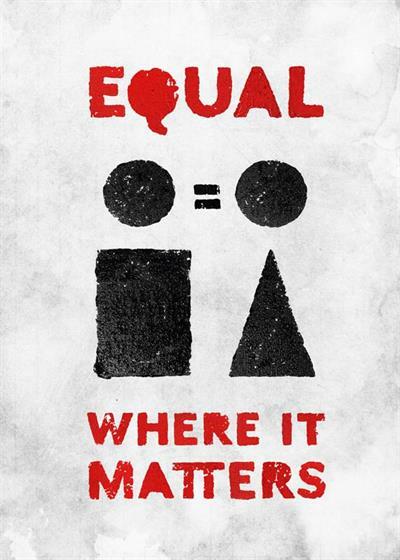 Let us continue to fight for equality in everything to everybody. Changes should start within home. Make your kids see the world equal from their window. Thoughtful article, like any major issue in society, it is difficult to accept change and change comes slowly. Having grown up in a neighborhood where mothers used to be at home and fathers at work, I think we are slowly trying to narrow the gender bias gap and in a few years time, it would be marginal. There has been a steady increase in the presence of women in politics from the local ward corporator to the highest office in India. Similarly, their presence is certainly felt in the corporate world. In the entertainment sector also, there are several established female actors who can carry an entire movie on their shoulders.There are mother's who come back to acting after childbirth. I think in all the above, the role of women is acknowledged, the major differences being in the pay scale, benefits and their assessments. Sadly this exists even in Hollywood and biggest professional tennis events too. Gender bias in marriage and individuals roles is also changing in the metros. We read about women bold enough to stand up against harassment or walk out of marriage if they are not given their due respect. Yes, things need to change and maybe the pace of change also needs to be increased. The author has a made a good attempt in explaining her views about gender inequality. Yes, I also feel, there was a hell lot of a problem in our country and it appeared as if it was the male-dominated environment. But slowly things changed and we are now seeing that ladies are active in all the areas as active as males. But the only percentage may vary. Coming to the aspect of remuneration now the wages and salaries are same for same work and designation. Coming to transgenders probably still a lot of work is to be done. However, the percentage being very less it may not take much time for them also to get equal rights. Already recently supreme court also given a verdict in their favour in a case. Slowly they will also make their presence felt by all in all fields. A good presentation and I wish all the best to the author. Yes of-course, gender discrimination is a sin. But we are addicted towards gender discrimination and only people like you can make gender equality a reality with your writing skills. Pen is mightier than the sword. The article has nicely brought out the issue and way forward. I want to add certain crucial things to this issue. 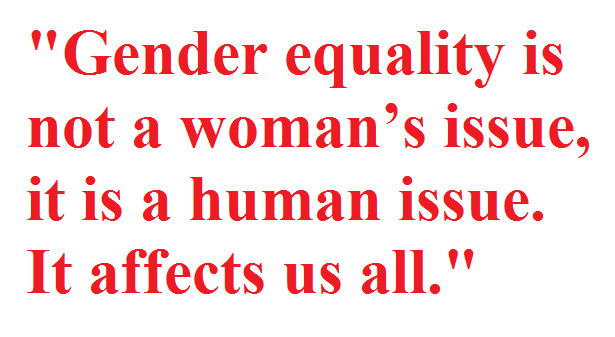 We must strive for eradication of gender bias in our society. It is an evil thing to differentiate between different genders just because society has presented them so. Let us at the same time try to understand the genesis of this bias. Why it is there and who created it. The human race developed and evolved with time and today we are living in a modern scientific world. In the primitive times the two genders male and female were basically for reproduction purposes like animals. Both of them hunted in the fields as per their physical strength and enjoyed their food. Female had additional burden of breast feeding the children and taking care till they grew up. There was no gender bias then. With advancement of human race and civilization, certain tasks were assigned to male and female by the social leaders who were dominantly males. The gender bias started from this point. With time it became so prominent that females never thought anything beyond their prescribed limits. Now they are realizing this and openly fighting against this evil. I cannot fully agree with the author. Gender bias did exist earlier, but now it has changed a lot. We can't expect to have a full change in a few days time, it obviously takes time. Now we can see women in almost all the fields and in every department. Mostly housemaids were women earlier, but now it has changed and both men and women do work as cooks or maids. Similarly, now many men have taken up nursing job. Women were not even allowed to go to school in the olden days but now we have women entrepreneurs, scientists, doctors, aerospace engineers, teachers, accountants, drivers, conductors etc. Changes are happening in both the genders and we need to accept it. Women cannot be like men because nature has created her differently. She is the one who has to give birth to a child and take care of the child. We can't shift this responsibility to a man. Obviously, she would want her maternity leave and time to spend with her child, No, mom would say that she doesn't need time for these. Hence organizations who want the employees to stay late would not prefer women. I do not find anything wrong in that. If the same woman is asked to sit late, she will come up saying I am a lady and still, the organization asked me to sit late. We accept it or not, men are stronger than women. Women need a safety as they are not strong enough to fight their enemy physically. Sitting late at work and traveling alone is not safe for women as she won't be able to protect her. A sick person might not be recruited by an organization, irrespective of their gender. But if it is a lady, we might say it is due to gender bias. Wherever possible, women are getting a chance and we should not ignore the fact. I agree that the attitude of the society towards women is different from that of a man. It is high time we change our attitude. Also, women are not safe inside or outside her house. If all these scenarios change, she will get more opportunities. Now, some women themselves deny the offers that they get maybe because the travel time is too much or she has to sit late. This makes the organization think that if they hire a woman she will have excuses and there work will get delayed. From a company point of view, they will give importance to their work. In case of any disputes or complaints in front of a court, women are always getting benefited. Isn't that a gender bias? If we speak about equality, then women should not be given any special considerations. Also, why does she need a reservation in politics when men are not getting it. Is that what you call equality? @Chitra. I completely agree with your point that women are physically not as strong as men. Yes, gender equality is necessary for all genders. If women are highly prioritized in any field and men do suffer because of that, then it also need to be considered. Who does all these things? Society. What consists a society? It is the people like you and me. The law, rules and regulations, everything is framed by us and for us. In the paper, everything and everybody is equal, but in reality, men are benefited. You mentioned that women get benefited in disputes taken to court. Let us consider, the divorce case. Working women cannot get alimony unless she provides the reason for her demand. So, in the eyes of law, men and women are same. They see everyone as human. Children may be given some allowances. That is it. Men are not new to cooking and nursing. Hope everyone remembers King Nalan was famous for cooking and Nakula, an Ayurveda expert. Men were given freedom to learn anything and explore everything. In olden days, only Devadasi were allowed to learn singing and dancing. So, only women had limitation towards education. Of course, now the scenario has changed. Now, everybody has the right to learn. But how does it come? People like Ramabai Ranade, Mahatma Jyotiba Phule, Periyar and Ambedkar fought for it. Changes did not come on its own. For social reforms, a revolution has to happen. Revolution can happen with an increase in awareness and this article is just a drop of it. There are few women, who can fight for themselves like Sudha Murthy, a writer and philanthropist but well known as Mrs. Narayan Murthy. She applied for a floor level job in Tata company, where lady candidates are prohibited. She sent the letter to Ratan Tata directly, that she needs to be allowed to attend the interview and the job can be decided later. She was called for the interview, evaluated and given the job. Not everybody is taking chance to fight against their rights to get what they deserve. So, these awareness are important. Women should first be given chance, then the decision can be made. But many, think that women are physically unfit or incapable for night shift jobs or that they may take a long break for maternity and importantly that they will not be sincere to work and will get often deviated with their personal issues etc are wary about employing women. I don't blame men, that they treat women bad. Men are good and they are ready to share household responsibilities. So, now the society has to come forward and accept women for work and financial independence. Initially equal rights are given to a woman in today's world especially in jobs. Today a woman can perform any type of job like men. But later when she requires maternity leave or leave to take care of her children, then she is not given the chance to progress in the organization. Slowly, she is neglected. So, instead, the organization should impose better laws to support women responsibility and also help her to flourish. They can grant her unpaid leave but at the same time, help her to cope up with the absence. They should remember that both men and women are important in an organization.